Hutchison's Three UK network lost 44,000 active customers last year, but saw its revenue increase slightly to £2.439bn from £2.425bn. The country's fourth biggest network boasts just over 10 million active customers, with 6.89 million of them on contracts and just under one-third on pre-pay (PDF). The UK mobile arm of the Hong Kong giant is embarking on an expensive transformation project to make use of its plump, 5G spectrum. This involves virtualizing its RAN network, its core network, and overhauling its IT systems in preparation for 5G, and the procedure isn't cheap. Accompanying its financial statement (PDF) today, Three said annual capital expenditure rose from £459 to £462m – £245m of which was slathered on internal transformation projects. After being last with 4G, and Ofcom allowing it to shift its allocation down by 5MHz last year (closing up a gap), Three UK has pushed its status as the only UK operator with 100Mhz of contiguous 5G spectrum, seeing this as a chance to compete. The contiguous stretch includes the 40MHz of spectrum it pocketed when it acquired UK Broadband Ltd for a strategic £250m bundle in 2017. The mobile firm will have "effectively doubled" its spectrum by the end of 2019, CEO David Dyson told analysts late last year. 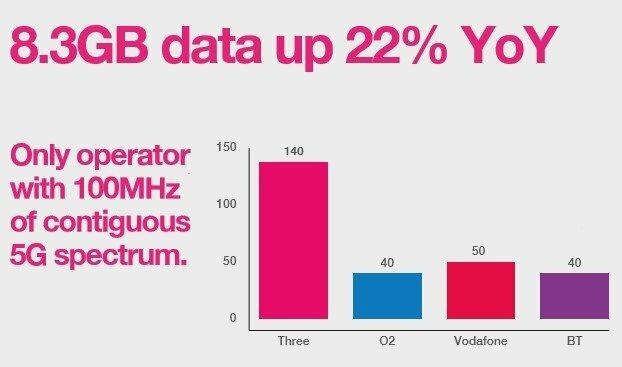 LTE now carries 79 per cent of Three's UK traffic. Despite being the smallest and "slowest" of the networks, Three's customers have had an insatiable demand for data. The average consumption per user rose to 8.3GB, up 22 per cent year-on-year. The network offers a "Go Binge" zero rated bundle. Consumption of Netflix, Deezer and Apple Music for example is outside the data cap. Three UK already provided the network for MVNOs Carphone's iD Mobile and its own SMARTY, a SIM-only competitor to O2's GiffGaff. It added a third last June: Superdrug. The latter is also owned by Three UK's parent – Hong Kong conglomerate CK Hutchison.